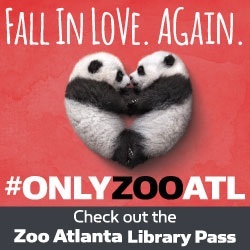 Check out, watch, and return the Zoo Atlanta Family Pass DVD to your lending library on time and in good condition for your Zoo Atlanta Library Pass! The librarian will provide you with an authorized receipt. Bring the receipt to Zoo Atlanta Monday through Thursday along with the library card used to checkout the DVD. Do not bring the DVD itself; only the receipt and library card are needed. One authorized receipt is good for free admission for up to four people. Larger family groups must pay for any additional admissions that they require.